Middleham Falls We begin our journey with a drive up Roseau Valley, full of panoramic landscape views.After about 25 to 30 minutes we should arrive at the parking area where we begin our hike to the Middleham Falls, located in the rainforest of the Morne Trois Piton National Park. It will take us about 45 minutes to get to the waterfall.The trail is well maintained but can be rough in certain parts as it rise and fall its way through the rainforest. 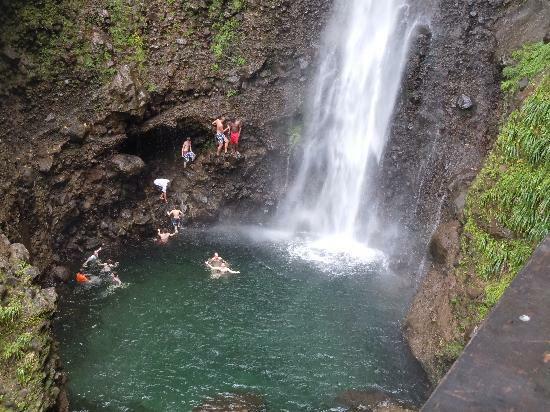 The Middleham Falls is approximately 282 feet high with its waters rumbling down into the pool at its base, and thus the tallest falls in Dominica Tours. A dip into the pool is recommended. Titou Gorge After the Middle Ham Falls, we will then go for a 10 minute drive to the Titou Gorge. Here we start a swim in an open out space then continue a 2 minute swim between two huge rocks, Before reaching the waterfalls at the end. Trafalgar Falls We then proceed to the Trafalga Falls, for a treat of the twin falls, the father falls (125ft) and the Mother Falls (75ft).After a 30 minute drive to the parking lot, it only takes about 10 minute walk under the canopy of the rain forest up to the Falls view point. 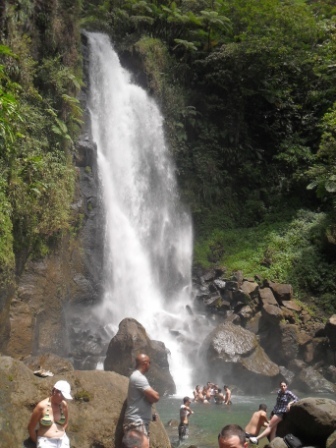 Here one will see the two spectacular falls.After you may proceed below where you can swim in the falls’ refreshing cold water or the warm volcanic mineral water. Going below one will encounter huge slippery rocks and will have to follow the instructions of the Guide.